My favorite snarky hacker / dotcom millionaire / nightclub owner Jamie Zawinkski has a Roomba and recently had some problems with it. But everything was sorted out because iRobot shipped him an OSMO firmware upgrader to “fix” what sounds like a malfunctioning odometer sensor on one of the wheels. 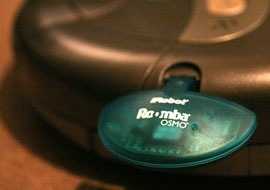 * My personal cleaning robot has malfunctioning hardware. * The manufacturer sent me a piece of hardware to update the software. * That software fixed the hardware. Once again iRobot shows itself to be not only a leader in domestic robotics but also one that understands the proper way to interact with customers that makes them so happy they become advocates.